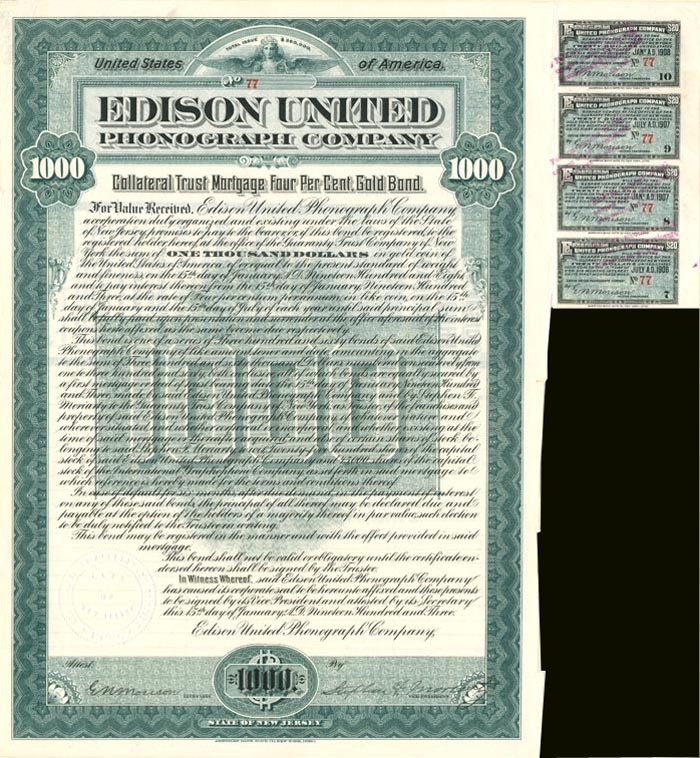 $1,000, 4% Uncancelled Gold Bond. This company was an attempt to reorganize the Edison United Phonograph Company which had been organized in New Jersey on February 24, 1890, to manufacture and market phonographs and graphophones outside of the United States and Canada. It had complex stock and contractual relations with Edison, the Edison Phonograph Works, and the International Graphophone Company. The company entered receivership in the spring of 1894; it was probably dissolved in 1902 and this financing appears to be an attempt to fund a reorganization of the company. It is signed by long time Edison associate Stephen F. Moriarty as vice-president.